Join us for all FOUR weeks of cookie features, recipes, and linky parties. 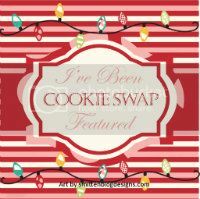 Make sure you come back each week for a great new cookie recipe, plus each blog will be featuring their own favorite cookie links from the party! This particular recipe took a bit of coaxing from my sweet husband to get it. It's one of my mom's recipes she makes every Christmas, and everyone loves it, so, of course, she was slow to part with it. However, I take after my dad when it comes to sharing and believe that if you have something worth sharing, you should share it. This recipe is definitely worth sharing! Bake at 300 degrees for 30-35 minutes. Roll them in a small bowl of powdered sugar while they are still very warm. This batch should make between 3 and 4 dozen cookies, depending on the size of the balls. I also wish I could tell you exactly how much powdered sugar to use, but we just guess each time. Start with a cup and add as you run low. I hope you'll enjoy these cookies as much as my family does! This recipes uses the best of both worlds cake mix and candy! Since each of the four co-hosts picked out her favorite cookie, be sure to check all four blogs to see them. Don't forget to grab a button if you were featured! Please follow all four co-hosts. 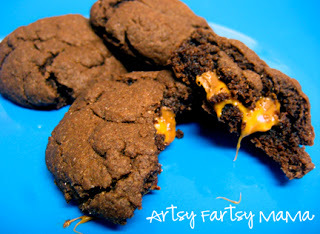 This linky is for COOKIE RECIPE posts only, please! Link up as many times as you want! This is a month long party so keep coming back for more recipes and features! Each blog will be featuring their favorite links each week! I'll be sharing this post at some of these parties here.